NEW REMODEL Family Beach Home! Steps From a Quiet Beach on the Bay! Come on over to the bayside! 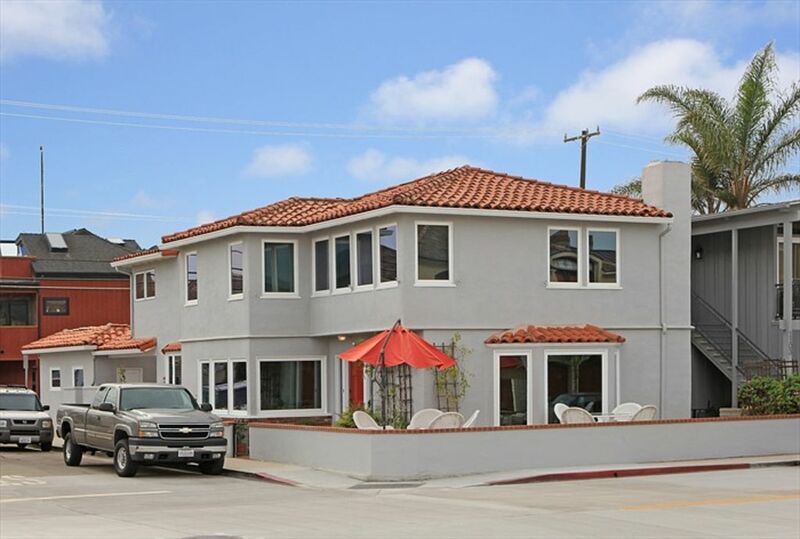 This classic four-bedroom home is steps from the bay and across the boulevard from the beach. A wrap-around patio with bay views, a living room and a spacious family room, three car garage parking, large brick patio and updated bathrooms make this rental an ideal home away from home. The front living room has a wicker couch and two side chairs, coffee table, fireplace and plenty of windows to take in bay views. In the corner, a glass topped table with seating for four is great for meals or games – wood-look tile floors downstairs make clean up easy. The adjacent dining room has an oval table to seat eight, and more bay views! On the other side of the pass-through window, the compact kitchen has a microwave, dishwasher and plenty of cabinet and tile counters for storing and preparing meals. A tile “island” seats six on stools for quick bites or snacks. Step down one step into the large family room with wicker couch and loveseat, a side chair, TV and a ceiling fan. Sliders here open to the brick patio to expand indoor living space. In the hallway, a newly remodeled full bath with cool claw-foot tub and a separate walk in shower provides easy access for “fresh from the beach” showers via a side door. A laundry room just off the kitchen has a full size washer and dryer and entry from the brick patio. The home includes four bedrooms, all on the second floor. A king bed graces the bay view master bedroom with en- suite “Jack & Jill” style bath featuring custom tile work and a walk-in shower. The room also has a futon and desk with chair. The second bedroom has a queen bed and side chairs, the third bedroom, two twins. You can sneak a peek-a-boo view of the ocean from the corner of this bedroom. The last bedroom is ideal for the kids with a twin over double bunk bed and a double bed, a flat panel TV and direct access to the second Jack & Jill bath with walk in shower. The huge wrap-around patio on Bay Avenue has tables, chairs, an umbrella and calming bay views. Grill family favorites on the back patio with easy access to the kitchen. Sharing meals together while watching sailboats on the bay or enjoying beverages under the stars will make your time at the beach unforgettable. The garage has space for three cars and a Tesla "home charger." Ten-acre Marina Park, four blocks away, with The Lighthouse Restaurant, an outdoor fitness circuit, basketball courts and picnic area allows visitors to soak up city and bay views. The kids can visit the playground with mini-lighthouse and run through plenty of grassy space. The elementary school is close by as well on the oceanfront. Kids will love the playground, accessible to visitors when school is not in session. Balboa Village is about fifteen minutes away on foot, but worth the trip. Visit Harborside in the historic Balboa Pavilion for amazing views and unbeatable happy hour deals (try the fried calamari!) every day, or seafood in the bayfront dining room. Other local’s favorites are Cruisers, Newport Landing and casual Great Mex. Take the ferry to explore Balboa Island and its many boutiques and eateries or rent a bike and pedal the bike path (boardwalk) to access the entire Peninsula. Go north to the Newport Pier area with more shops and local eateries. Purchase freshly caught fish direct from fishermen at the Dory Fleet Fish Market, established in 1891. Seaside Donuts serves up fresh donuts 24/7, and 21 Ocean Front and Fly ‘n’ Fish offer more upscale dining. Charlie’s Chili on McFadden Square is a “don’t miss” breakfast spot for many out-of-towners. The area offers boundless options for family fun! Big, clean, beautiful views, easy access to beach & bay. Even though we were supposed to get the keys at 4, we went to the house and the cleaners were still cleaning the family room and kitchen. They left at 4:45. Disappointing that we couldn't unload and begin dinner preparations as planned. The "packing for your vacation rental" email stated that 2 full rolls of Toilet paper, plus small soap, would be left in each bathroom. Each bathroom contained less than a half roll,one almost bare, no extra rolls, no small soap. I keep notes each year of what to bring, and since we were shorted approximately 5 rolls, we had to obtain additional T.P. Last year we had the correct amount, and we had t.p. left over. We thought you should know that the cleaners are not leaving soap, t.p. or a roll of paper towels. A major problem we had this year was the inability of the cleaners to remove the dog hair. My wife was extremely upset with the huge tufts of white dog hair throughout the house. It was especially upsetting when t he butter dish and pancake plate on the dining table ended up with large wads of dog hair on them. I don't know the answer to this problem, but it was a problem. Additionally, we swept up large amounts of dog hair wads (probably would fill a Gallon-sized Ziplock bag. We have two family members who are allergic to dogs, and suffered with sneezing and coughing the entire week. It is a very nice house, and suits our family of 11 well, with the exception of the copious amounts of dog hair. We Highly Recommend Burr White and this Property! Every year we take our families to Newport/Balboa and have stayed a few additional nights each year; we are on our fourth year and decided to stay for 7 nights. We had 11 total people and this property was perfect!! The location and size of the house was exactly what we were looking for. We couldn’t have been happier with the house, location or property management. We highly recommend both and will book with Burr White again next year. We also had a surprise (wedding) in our vacation and when we had to shuffle a date in the beginning Burr White was amazing in getting it all figured out for us. Thanks so much for making our family/surprise wedding trip so memorable and easy :) - Mr & Mrs. C Travelers looking to book this property will be very pleased with the size; as it is exactly as described, clean, well maintained (owner and management take pride in the home and it shows) close to the beach and bay, 3 car garage was a huge bonus and being able to walk to both piers all week for Coffee was perfect :), not a loud party side which is our style very relaxing, and the people were all very nice. We had a great week, great location, booked for next year. Only minor complaint the queen bed in the second bedroom is getting old and probably needs replacing at some point. Thank you for taking the time to share your feedback with us! We have documented your comments regarding the bed and will forward them for review by our management and maintenance teams. We look forward to seeing you again next year! We had a great time at Newport Beach! The house was perfect for our family. Are only regret was that we didn't stay at least one more day! We hope to see your family next year for another fantastic Newport Beach vacation! Great place for a small family gathering. Loved it. Very clean. Great location. Tucked away enough to yield good privacy. We are so pleased that you enjoyed your stay and we look forward to seeing you again on your next trip to Newport Beach!